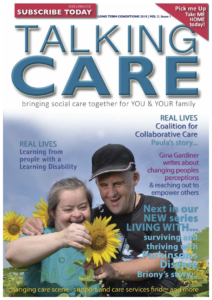 Talking Care is the premier magazine about adult social care, published especially for Oxfordshire. Our latest edition focuses on long term conditions (LTC). By LTC, we mean disabilities and illnesses, such as, Parkinson’s, multiple sclerosis, enduring mental health issues and many other physical or mental ailments, that cannot, at present, be cured, but people living with these conditions can be supported to maintain a good quality of life. We also include conditions such as autism, which may affect a person’s ability to interact with their everyday world; and seemingly everyday ailments such as asthma, diabetes and epilepsy. 72% of the general population are in work, whereas only 59% of people with a LTC are in work. Only 35% of people with a mental health condition are in work. 20% live with three or more LTC. 70% of health and care spend. Around fifteen million people in England (Long Term Conditions Compendium of Information: Third Edition, DH, 2012) have one or more long-term health conditions, and the number of people with multiple conditions is rising. The majority of people aged over 65 have two or more long-term conditions; the majority of over 75s have three or more. Overall, the number of people with multiple conditions is rising, projected to reach 2.9 million this year. In a survey (Patients in Control: Why People with Long-Term Conditions must be empowered, IPP, 2012), three-quarters (75%) of respondents agreed, or somewhat agreed that, if they had better information and support, they could become more expert at self-managing more of their care independently at home. Co-production, as we call it, is about people being empowered to take control and drive their services. In an ever pressurised sector, the stories inside this issue, illustrate how important it is for people to be involved in the management of their own care and support and to be involved in the development of services. They are inspiring advocates for involvement, as well as having amazing personal will-power and drive to live well. Let’s keep on talking care.